Archeologists peel back the earth to learn about people who made history. 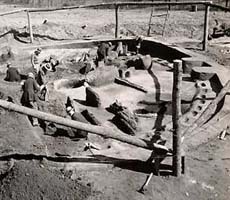 Archeologists use all kinds of tools, like shovels or buckets, even large digging machines such as bulldozers. 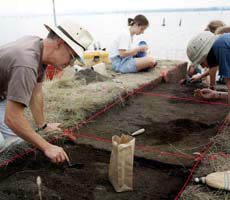 Archeologists work by digging into sites and collections. 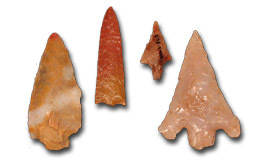 When they excavate, archeologists use tools you might recognize. Putting together a story from archeology is like doing a big puzzle without the box lid. Artifacts are some of the pieces, but only part of the total picture. Keep going to find out how archeologists put the puzzle together. Surveys take place in fields, underwater, and even on rock faces. The flags mark where artifacts lay on the surface. 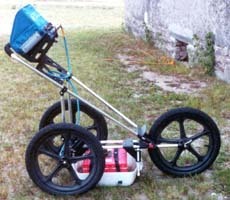 A ground penetrating radar system on wheels? Undergound archeological sites, you just try to hide. "Where do we start?" An archeologist scans a field. A glint of white catches her eye. She bends down to see a piece of ceramic and some rusty nails. Marking the cluster of artifacts with flags, she keeps looking, but this looks like a good spot to excavate. 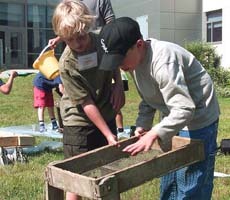 A site survey helps archeologists narrow down where to start. They mark likely places and dig small, but controlled, test pits to get a preview of what they might find. 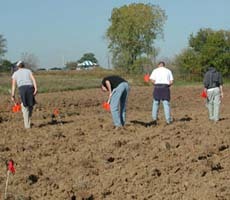 Sometimes computer-driven equipment helps them to see into the ground. Careful measurements now mean fewer headaches later. At the top of the orange and white stick is the datum point. He'll plant the stick in concrete so it will stay put. Looking through the transit measures the distance between features of a site. See the thing at the end of the string? These archeologists are using it to help measure the positions of artifacts. Who cares about being a professional maker of measurements? Archeologists do. 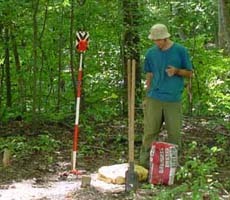 Careful measurements are important to make a good record of a site. 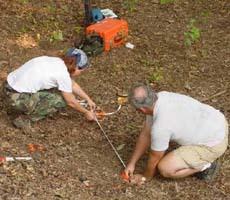 Archeologists use geometry to lay out excavation units and triangulate the locations of features. They start from a datum point. Peering through a transit measures across sites. A plumb bob weighs down the string to make measuring depth easier. 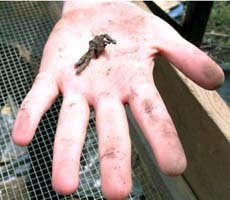 Some researchers dig into libraries, but archeologists dig in the dirt. See the red strings? 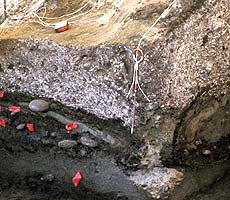 They outline the excavation units. 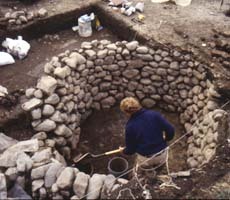 In hearths like this one, ancient people built fires for cooking, warmth, and to make things. People dumped all kinds of stuff into this well. 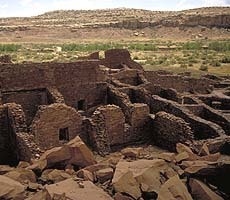 The ancient Chacoan people built amazing urban places. 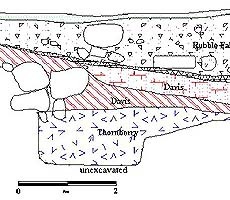 Excavation is the way archeologists look below the surface. 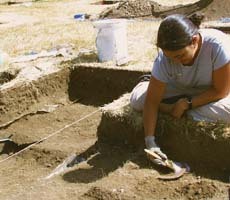 Excavation destroys an archeological place, so archeologists are very careful about how and where they dig. 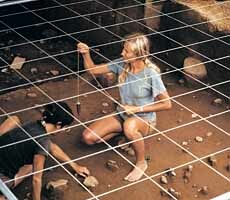 Archeologists grid a site before excavating. 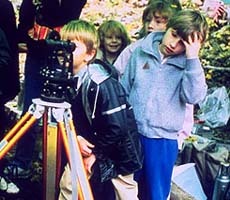 Then, layer by layer, unit by unit, they use different tools to dig, photograph, and draw what they see. They also take soil samples and bag up artifacts. If they're lucky, they find features like ancient cookstoves or wells or even buildings. Stratigraphy helped archeologists make a timeline for the Mississippi River region. Compare the last image with this one. See the differences between the the colors and textures of these layers? Each layer of this cellar was used by a different family. 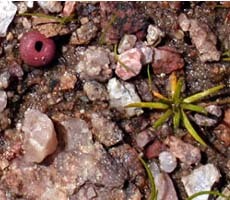 Each new layer of soil, or stratum, signals a different cultural time period. See how the soil layers change color? A stratum might be a few centimeters or many feet thick. 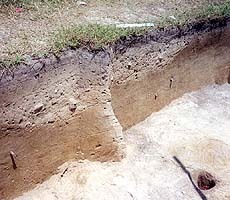 Soil layers usually get older the deeper they go. 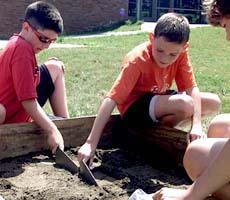 Archeologists dig until they hit subsoil, a layer without artifacts. Sometimes archeologists name and date the layers from the artifacts, the texture of the soil, and careful mapping. They put this information into a timeline for the site. A chance to get your dirty paws on the past. Archeologists play lots of show-and-tell around the screen. Find the bead! Find the bead! Tiny trade beads, miniscule seeds, slim fish bones ... none escape the wetscreen. 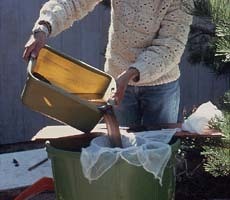 Buckets and shovelfuls of dirt are dumped in a screen held by a wooden frame. Shaking the screen really hard leaves behind artifacts, stones, and debris. The artifacts go in labeled paper bags to study later. Sometimes archeologists take samples of soil for analysis. For tiny objects, like beads and seeds, archeologists shoot water through a fine mesh screen in a process called waterscreening. Notes and drawings describe what excavators did and saw. 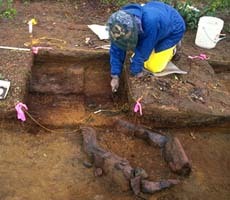 Archeologists in the 1930s excavated lodges, ceremonial areas, and mounds at Ocmulgee in Georgia. 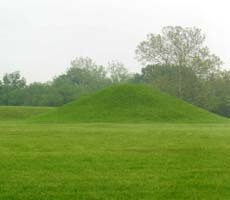 Maps show the features of a site at Ocmulgee. 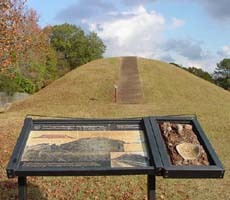 Archeologists working in the 1930s help us to understand the mounds at Ocmulgee National Monument in Georgia. Good recordkeeping is really important. 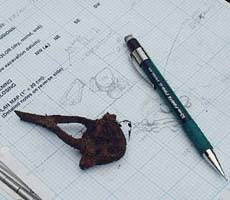 Archeologists make notes and draw interesting finds the entire time they excavate. The records describe what the archeologists saw in the units. Photographs and maps are another kind of documentation. They show what archeologists saw. If you've visited an archeological site, then you have seen how old archeological photographs and records help us learn about the past. Watch this space see where archeological evidence is found in California. 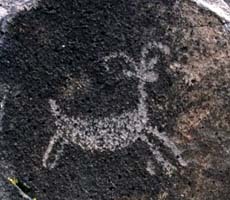 Why did the Coso Indians of California make rock images? 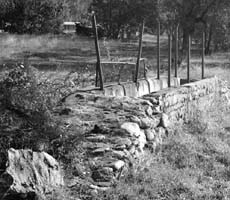 On historic sites in Fontana, California, farmers dunked their sheep in sheep dips like this to clean and de-bug their wool. 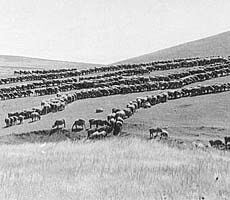 Sheep graze a hilly Californian landscape geologically and environmentally suited to their needs. 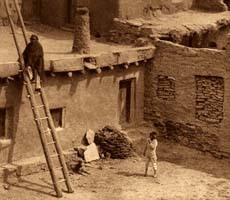 The dark material piled against one of the Zuni houses is sheep-dung for firing pottery. 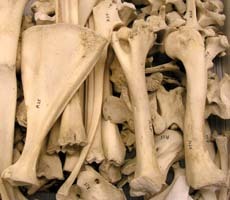 Faunal specialists compare bones to learn about the health and condition of sheep. A sheep is a sheep is a sheep, right? Perhaps. Remember the different kinds of archeologists? Each one uses what they know to look at sheep in a different way. During a dig, they pool ideas to find all the possible sheepish meanings. Maybe they see sheep images on rocks. Or excavate a historic sheep farm. 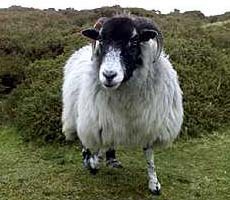 Or study how grazing sheep change landscapes. Or wonder about the uses for sheep. Or head to collections to compare the faunal finds to another site.